It’s been a very long time indeed. Since my last post, we’ve had another baby and continued to expand the empire – the pottery empire – slowly, yet surely. 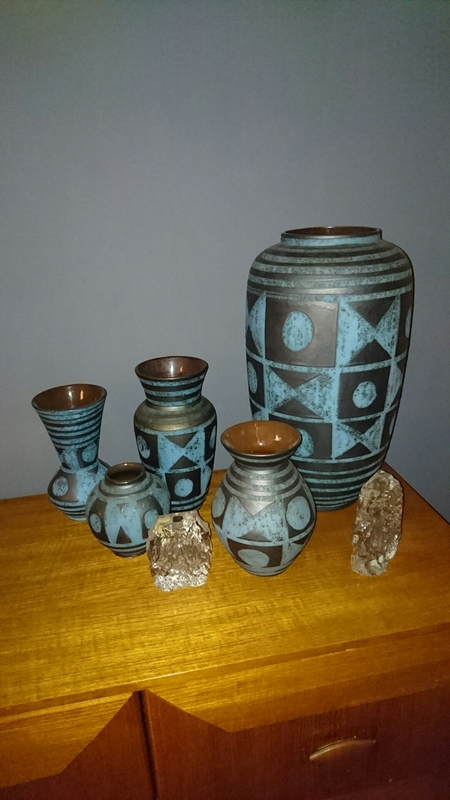 Potsandpots is doing well in its online incarnation, supplying pottery to buyers from around the world. We’ve had some lovely buyers, both old friends and new, come and visit us at HQ in Hadfield. It’s been great fun. *in reality, they have never stopped. They just weren’t being documented. Welcome back Emma. Long time no blog….. Did you ever receive my message concerning your wonderful collection of vintage women’s magazines? A happy new year to you! Andrew. Hello again Emma – Thank you for replying. I posted a message to you quite a while back asking if you would kindly help me to complete my late mum’s ‘Woman’s Own’ Patience Strong poem collection. I noticed that one or two issues that you have featured on your website are not amongst my mum’s poem scrapbooks and I have been trying to complete the missing poems since she sadly passed away suddenly a few years ago in her memory. It would be if you lovely to hear from you but quite understand if you decide not to. Kindest regards, Andrew. Woman’s Own – As of 11th March 2016. 1950 – Thurs, 12/19 Jan; 23 Feb (only); 9/23 March; 6 April (only); 4/11 May; 29 June (only); 27 July (only); 3/10/24 Aug; 21 Sept (only); 5/26 Oct; 2 Nov (only); 14 Dec (only). 1951 – Thurs, 18/25 Jan; 1 Feb (only); 22/29 March; 19 April (only); 3/31 May; 13 Dec (only). 1952 – Thurs, 10/31 Jan; 7 Feb (only); 3 April (only); 5 June (only); 17 July (only); 18 Sept (only); 13/20/27 Nov; 25 Dec (only). 1953 – Thurs, 22 Jan (only); 25 June (only); 17 Sept (only); 3 Dec (only). 1954 – Thurs, 25 March (only); 1/15/29 April; 3/10 June; 15/22/29 July. 1955 – Thurs, 10 Feb (only); 3/24/31 March; 12 May (only); 6 Oct (only). 1956 – Thurs, 8/29 Nov; 6/27 Dec.
1957 – Thurs, 14 Feb (only); 14/21 March; 11 April (only); 20 June (only). 1958 – 26 Nov (only); 31 Dec (only). 1959 – Week ending, (Sat); 11/18/25 July; 1/8/15/22/29 Aug; 5 Sept (only); 12 Dec (only). Thank you once again for your kind and helpful reply Emma. Dear Emma, thank you ever so much for your lovely kind reply. Yes, photocopies would be perfect. Mum used to carefully jot down the actual date she cut out the Patience Strong poems from her weekly ‘Woman’s Own’s’ so it has made it quite easy to figure out which ones were missing. If I am not in touch beforehand may I wish you and your family a lovely Easter! God bless. Andrew. Thank you, happy new year to you too. I was actually telling someone about your blog at the weekend: your post on comparing collecting WGP to fishing, I think it was.